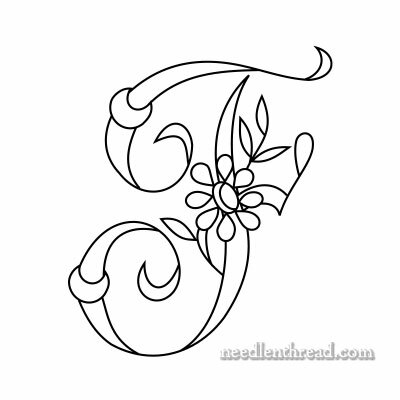 Here’s the E and the F in the latest monogram alphabet that I’m adding to the free embroidery patterns section here on Needle ‘n Thread. This particular E is quite pretty, I think! It’s scripty, without being elongated, too scrawly, or over-formal. I like it! 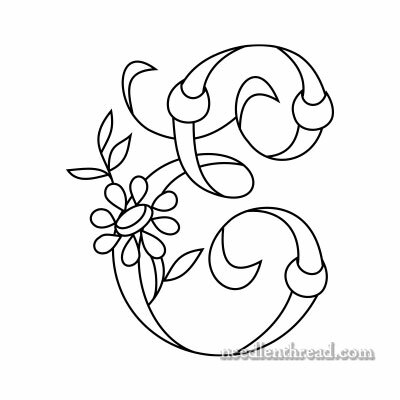 I like to include some stitching suggestions or recommendations with the monogram patterns, and today, I have two suggestions, but they come from other websites, so I’ll just provide links to the examples. The first is an exquisitely embroidered monogram – somewhat similar in style – from L’angolo di Stefania. Stephania embroidered this gorgeous letter P, outlining the outside of the letter in a darker pink, and filling in with long & short stitch in a lighter color. The flowers are worked in padded stem stitch. You could follow the same approach with the Daisy & Rings alphabet, embroidering the lettering in long & short stitch and the rings and the flower in padded satin stitch. The other idea for today comes from a photo on flickr – this embroidered monogram C.
The whole monogram is worked in white on colored fabric. The letter is outlined with trailing, which is satin stitch worked over a single thread for padding. The decoration is worked in padded satin stitch. Following the same approach with the Daisy & Rings alphabet, you could embroider the floral decoration and rings in padded satin stitch, and work the letter in trailing, all in white, either on white fabric or on colored fabric. It would be lovely! 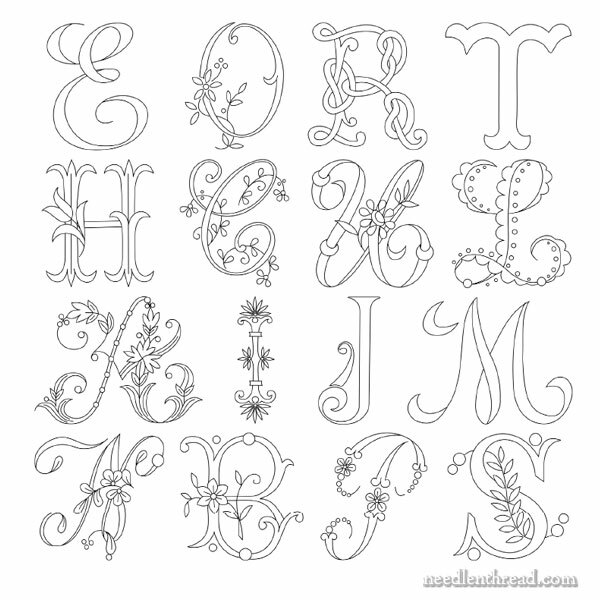 Here are the printable pages for the E and F in this alphabet. If you choose “no scaling” (or a similar setting) on your printer, the letters should print at 2″, 3″, and 4″ high. You can enlarge and reduce them to suit your needs! I agree with you that the Daisy and Rings E and F monograms are very pretty especially the E and I like the recommendation sites of embroidered monograms. Thanks for the free patterns and for sharing these with us. I hope you are feeling better. Thatnks, Anita! I’m getting there…it’s just a matter of time. How was your trip? I hope the weather didn’t turn out too bad and that you enjoyed yourself! Thanks for asking. I had a great time with my twin nieces and the weather was quite warm to hot. Dorset is a lovely part of Britain it’s very green and hilly the views were beautiful. I visited a Castle, went to some lovely coves and country villages and spent quality time with my brother and nieces. I hope you are feeling better. Here at last is the secret transmitted by a professional embroideress on how to pad elongated forms before covering them in satin stitch. The video is in French. Fist she shows how to secure a cardboard form onto the fabric and starting at 04:00 she demonstrates how to build up the padding. I knew everything I read or was told was wrong! This is THE way! LOL! Ok, that’s One Way to do it. But it isn’t the Only Way! Don’t discard everything you’ve read! hope you’re feeling better. I am not a fan of monograms etc myself, but in my online wandering I found the Handbook of Lettering. Some lettering would lend itself to fun-stitching. Barbara Christopher Audubon’s Birds, with stitch and colour chart, Dover Publications, Inc, New York 1979. Hi, Mariolina – Thanks! I had to edit the link out, because that book is still under copyright. Its last copyright date is in the ’70’s, so it really shouldn’t be scanned and posted in its entirety online. I’ll check further on that, but from what I can tell from the copyright info, it’s not public domain material. I know this isn’t your fault at all – whoever first scanned and posted it online is to blame – but I don’t want to perpetuate the problem! Previous Previous post: Blackwork Embroidery Class Winner! Next Next post: Stitch Fun! Can You Name this Stitch?